Help make the newest Gorloks feel right at home. Come join the New Student Orientation (NSO) team in welcoming our new students to campus during NSO Weekend. We need your help as Orientation Volunteers (OVs) to make NSO 2018 vibrant, energetic, and memorable for our incoming Freshman, Transfers, and International First Year Students in their first days as new Webster Gorloks! As an OV you get to take part in the traditions and major events which make NSO special. Volunteer opportunities include: 1) Helping Orientation Leaders (OLs) Move-In New Students, and 2) Assisting the "Tunnel of Spirit" on Aug. 24. Volunteer by using the following link. Come join the New Student Orientation staff as we build a Tunnel of Spirit. 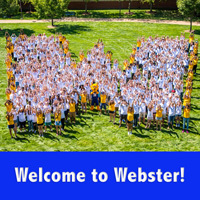 This is an opportunity to show your Webster pride as we greet new students and their families into the Welcome Session of New Student Orientation. Individuals volunteering for this role will need to be able to provide high energy, present a glowing smile, and have the willingness to have fun. Welcoming our new students during New Student Orientation is crucial and impactful to the First Year Student Experience. Please let us know if you are able and willing to volunteer by signing-up today here. We appreciate your time and care in making this experience a great one! Not available during New Student Orientation, but still want to help welcome students? The Welcome Student Committee invites you to help staff "Welcome Week" tables for graduate students during the weeks of Aug. 20-30. If you are interested in offering your time and energy, please click on this link to sign up to volunteer and see this post for more information. Note: Please be advised that Parking Lot D (the parking lot near Webster Hall, Maria Hall, and the Facilities Building) will be closed because of New Student Orientation Move-In starting Aug. 22-23. Employees and students are encouraged to park in any of the other campus parking lots including the Garden Park Plaza Parking Garage. Thank you for your patience as we welcome our new students and families on to campus!